Eagle's Store - family owned and operated since 1908 offers a complete line of fishing tackle, backpacking equipment, hiking boots, and an outstanding line of western wear. We have moccasins, cowboy boots, Native American crafts, jewelry, and more. Samuel Eagle founded Eagle's Store in West Yellowstone in 1903 when the railroad first came through. The store is listed on the National Register of Historic Places and was built in the years between 1927 and 1930. One of Eagle's signature attractions is its old-fashioned soda fountain. Its back bar was acquired in 1910 and the front tiled counter was added early in 1930. The original leather is on almost all of the stools! We've been serving fountain treats almost as long as there's been a town to stay in. 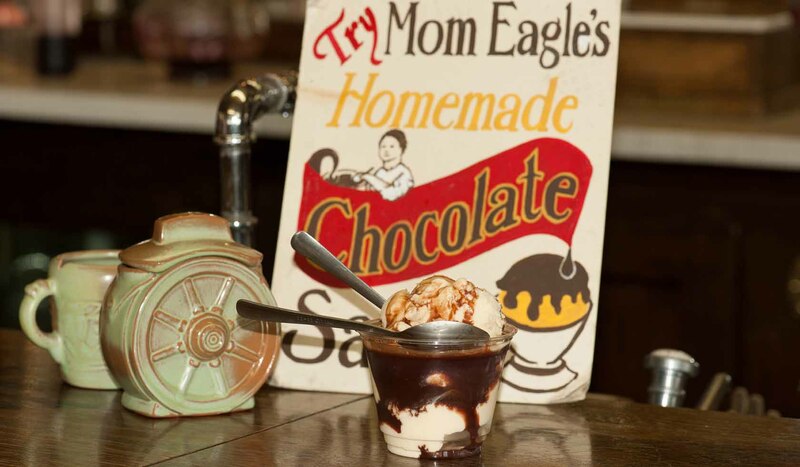 Today it's not easy to find a chocolate soda or malt but we still serve them at Eagle's, made with real ice cream and "Mom Eagle's Homemade Chocolate Sauce." Why not stop by Eagle's and order a treat? We'd be delighted to see you.